EmuCasino does not limit itself to offering just regular payouts to players through its casino games. At EmuCasino, we appreciate your trust and loyalty and that’s why we offer various Loyalty Membership Programs, right from the start. 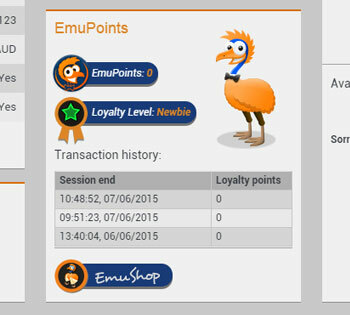 What are EmuPoints and how to collect/acquire Emu Points? How to track your EmuPoints? What is the EmuCasino Loyalty Program? What is the EmuShop and how to spend your EmuPoints? EmuPoints are a complimentary reward system where loyalty points are given out by EmuCasino for onsite activity, much in the same way that a land based casino would give out complimentary drinks to its patrons. Collecting EmuPoints is a ‘full activity’ based comp system at EmuCasino that give players a chance to win more free games, extra bonuses or even free cash prizes. Registration: Simply upon registering as a new player, you can win EmuPoints to start off with. Simply sign up a new account and get EmuPoints once your account is successfully activated. Daily login and play: What could be easier than just simply logging into your player account and play your favourite casino games. Players can earn Emupoints if they login for a minimum of 15 minutes and wager $50 within the log in session. 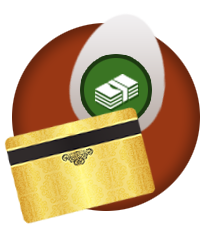 Deposit: Make a real money deposit into your player cash account and collect EmuPoints. On every deposit of $100 or above, players will earn 500 EmuPoints. Games wagering: The easiest way to earn EmuPoints is by wagering on your favourite online casino games. With over 800 top quality casino games on offer, players are sure to be spoiled for choice. Apart from winning big through the game payouts, players will also earn EmuPoints on single wagers regardless of whether its a win or loss. – For every $10 stake on a slot game or online Scratchie, players have a chance to earn up to 14 points. – For a Newbie, every $10 stake rewards players with 9 EmuPoints. As you move up through the VIP levels, you collect proportionally more EmuPoints, for the same wagering at each level. – Players are eligible to earn 40% extra EmuPoints on slot and scratch cards, once they reach the top VIP status, as an Elite member. – For every $10 stake in Blackjack, Roulette, Jackpot games, table games and video poker, players will collect 1 EmuPoint. Platinum or Elite players are awarded 2 EmuPoints per $10 stake. Find out more about how are loyalty levels work in our VIP club here. Upload Documents: Our licensing obligations and your account security requires the verification of player’s identity. EmuCasino will reward benefits for every step a player takes including rewarding EmuPoints for every document that players upload as part of our player verification process. For more information on submitting documents, please visit our Account Verification page. First Withdrawal: There’s no better feeling than beating the house, winning in a casino game and making our first withdrawal, and further earning EmuPoints on those withdrawals. Players will be able to collect 500 points on their first withdrawal. Recommend a friend: Help the EmuCasino family grow bigger by recommending EmuCasino to a friend and you will collect 3,000 EmuPoints for a start. Players at EmuCasino are constantly kept informed on their EmuPoints progress as we wouldn’t want them to miss out on the great bonuses and incentives that are on offer. 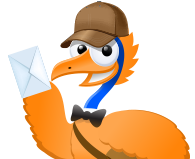 EmuCasino keeps close track of every player’s progress and emails players through an integrated mailing system at the end of every week after they have generated certain level of EmuPoint through various activities. They are provided with a summary account of the total points accumulated and list the activities that generated whose comp points. Furthermore, they are given the current exchange options available for their EmuPoint balance. You can track your progress on your own by going to the Cashier and checking their EmuPoints balance. You can also visit the EmuShop where you are free to shop for your online casino interests and loads more. We have a wide range of different exclusive promotions that we offer to our casino players; below we’ve listed the different levels of the EmuCasino loyalty levels, as well as some of the things at each level, that are on offer. Using EmuPoints – In the EmuShop? 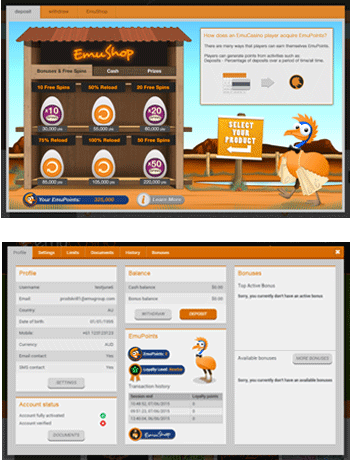 As players collect Emu Points by playing their favourite casino games, depositing to win more or just even registering, they are able to exchange these points at EmuShop. EmuShop is a one stop destination for players to exchange their Emu Points for great prizes and we’ve got something for everyone. 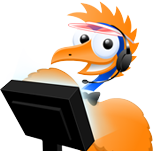 Once Eddy greets you after entering the EmuShop, players can feel free to spend their comp points and go on an online casino shopping spree. Players will notice three categories on the shop; Bonuses & Free Spins, Cash and Prizes. Depending on what the players want, they can go to each category and spend their EmuPoint. Free Spins: Players can now exchange your EmuPoints and get Free Spins at the EmuShop. We’re really excited to reintroduce this product category to the EmuShop. Starting at just 6,600 EmuPoints,players can purchase a minimum of 10 free spins, and for those who have accumulated a hefty amount loyalty points can exchange for up to 100 free spins. Deposit bonuses: Players can exchange their EmuPoints for deposit match bonuses, which can be claimed on the next deposit. There is a range of different percentage matches and max amounts to choose from depending on level of game play. Cash: Exchange their EmuPoints for instant cash rewards. Players are able to claim up to $250 in cash. These cash prizes can be further wagered on casino games to win more cash payouts. Prizes: For those who would like to win exclusive gifts and prizes, they can always go to the ‘Prizes’ category and select different gifts and holiday options that EmuShop offers. From regular gifts to exclusive trips and getaways, you can finally win something more than just cash.